If ever there were an ideal Miss California, it would be Alayna. Oh NOT to be mistaken with the Miss California pageant type. Our local army of Santa Cruz feminists drove that pageant out of town a few years ago. I'm talking about a REAL California representz woman; Covergirl for Surfer Girl; the picture of health, natural beauty, brains, strong athletic ability, and an edge for business success. Oh yeah, and a cute boyfriend never hurts! I met Alayna for breakfast at the Chill Out Cafe in Pleasure Point where she and Jed, (the cute boyfriend and personal board designer), were re-carbing after a morning practice session for an upcoming comp at Steamer Lane. 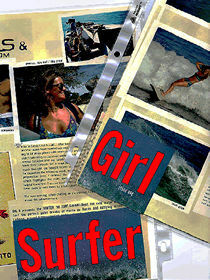 Alayna starts work at noon, (at the surf shop she co-owns with three other women), allowing her to surf every morning. And I DO mean every morning! On any off-occasion when she can not surf, she's on her sponsorship skateboarda Gravity longboard. She skates to and from work as a cross-training program, as it helps her with balance and keeps her in practice. 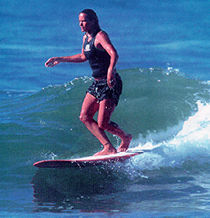 She can actually perform some surf maneuvers on her skateboard, although it is harder and scarier, she says. Jed (who is the son of the surf legend Greg Noll) although invited too stay, left for his job at Pearson Arrow so we got on with the interview. Clarkie: How did surfing get to become your sports habit? Where are you from and how did you end up in oceans all over the world? Alayna: I grew up in Palo Alto, CA and moved to my parent's summer beach house in Santa Cruz shortly after high school. A guy friend inspired me to try surfing. I learned to surf on a rental board at Cowell's beach and was completely hooked after my first day. I spent a good year surfing Cowell's and then began exploring more advanced spots around town and up and down the coast. I've been surfing now for seven years and competing for the last three. Clarkie: Were you active in sports in high school? Alayna: Yes, soccer, track, and a little skateboarding. Clarkie: How you like competing in your "love sport," a sport that is your regular exercise and spiritual cleansing, but has since become your livelihood as well? Alayna: Competing helps me fine-tune my surfing skills and pushes me to improve my level of consistency. For me personally, it has given me a higher level of self-confidence and has improved my social skills. It also allows me to travel. I travel around the West Coast to compete in the USSF (United States Surfing Federation) which is an amateur series. Clarkie: Your resume of accomplishments would probably blow our server, but I see lots of one's and two's here; you must be good! What is your most recent accomplishment? Clarkie: Have you ever had any serious injuries from surfing? Alayna: Not too bad. I got a fin stuck in my foot once. I developed a problem with sciatica, due to the position your back is in paddling out on your stomach. But, I have a good physical therapist, and I practice Yoga all the time. Clarkie: Have you ever had any encounters with sharks? Alayna: No! I have friends who have though. Although I have no fear of them, I avoid places where there have been known shark attacks, like up the coast. I wouldn't let sharks discourage anyone from surfing. Here in the bay, it's cool; sharks get annoyed swimming through kelp, so they don't bother. Clarkie: Here comes my usual question to women who participate in a traditionally male-dominated sport. What kind of respect, or disrespect do you get in the water? Alayna: It's awkward when your in a strange place. Sometimes men are territorial, but after they check you out and see that you know your stuff, you get the same respect. Clarkie: I swear you don't' look like you just washed up on shore from surfing. How come you look so good? Do you have any secret beauty tips to share with us? How do you take care of your skin out in all that sun exposure? Alayna: Hah ha hahaha. Actually I just jumped in the outdoor shower at Steamer, saw a discarded bottle of shampoo, and threw the 5 drops left on my hair. About all I use is shampoo in my hair, and lotion on my skin. The best beauty tip I can give is drink LOTS of water, lots and lots. Less make-up is better, fewer "products" are better, take lots of herbs and vitamins, and use sun screen always. This is about the point where Alayna said she felt a sore throat coming on, and showed me the Chinese herbal tincture the local health food store advised her to take. I'm an herb freak too and was familiar with that particular (gross tasting) one and advised her to conceal it in her orange juice, hold her nose, and go for it. I assured her it works, and secretly prayed she didn't throw up in the Chill Out. Clarkie: Tell us about the shop, how did it come about? Alayna: My love of surfing and my desire to see women surfers rise to the mainstream level drove me to join up with the other women who are now my business partners. We all wanted to create an environment that was user-friendly to all genres of surfersbeginners, women, or anyone interested in surfing who wanted a nice, relaxed place to gain shopping knowledgeand hang out. We opened our doors thinking that we would be catering pretty exclusively to women, but have found over the last year and half, that men are out there looking for the same level of respect and courtesy from a retail surf business that women are. We have noticed a rise in our male clientele and we are ecstatic! 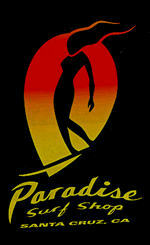 Clarkie: Paradise Surf Shop sponsors a team of their own right? Alayna: YES! I am team manager; check out our web page, where we will soon have a whole section on our team of women surfers, and ways that other young women interested in surfing can get involved. It was almost noon so I followed Alayna around the corner for my first visit to Santa Cruz's (perhaps California's) only all-female-owned, Paradise Surf Shop. Until then I had only driven by, intrigued by what that week's bikini-in-the-window color would be. I noticed a few things you don't typically see in surf shopssome custom designed jewelry, those little nice-smelling natural soaps, and some pretty wild-colored nail polish! And, of course the usual surf and skate paraphernaliasurfboards, skateboards, women's clothing, swim suits, wet suits, aloha shirts, shoes, etc. It's a very comfortable store. There is a big funky couch on which a dude was sitting eating a sandwich. In fact, there was a dude sitting on the front porch, come to think of it, there were dudes everywhere! Hmmmmm must be the nail polish selection! The store started getting hectic with Paradise friends arriving from out of town for the big longboard invitational competition that weekend. So I thanked her and passed around business cards as she introduced me to her friends and explained who I was, then we called the interview a go! Clarkie: Alayna, thank you so much for taking time out for the interview. 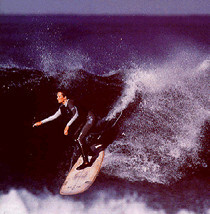 It was a pleasure getting to know you, and I wish you all the best with your surfing and business careers. I don't tell too many people this, but I have a longboard (skate) hand made by a kid in Misoula, Montana. You want to go cruizin on our boardz some day? Alayna: You got it Clarkie! And thank you for doing the interview. And my compliments to the breakfast-burrito wrap chef at the Chill Out.